KATHMANDU, MARCH 13: The Election Commission (EC) is making preparations to begin printing ballot papers from March 18 for the May 14 local elections as per the recently finalized local units under the federal setup. Working on the basis of the political parties wishng to contest the elections, the election body has already designed the ballot papers and the process of printing them is to begin after the EC board takes a decision to this effect. Before giving the final touch to the ballot papers, election experts and former election commissioners are being summoned to the EC for final consultations. 'They are being invited to give their overall inputs for the election management. Discussions will be held with them before finalizing the ballot papers," said EC Spokesperson Surya Prasad Sharma, further informing that the printing of the ballot papers will begin from March 18. Election Commissioner Ishwari Prasad Paudyal said the printing work will begin soon after they settle the election symbols for the political parties and the independent candidates. "Technicians have tentatively finalized the numbers and sizes of the ballot papers and the printing will begin once the elect symbols are ready," said Paudyal. State-own Janak Shikshya Samagri Kendra Limited has been assigned the tak of printing 15.5 million ballot papers while private firms will print the nomination forms and the by-laws and regulations required for the elections. Janak Shikshya has already procured 450 metric tons of ballot printing paper, according to officials. Informed sources at the election body say they have tentatively completed all the internal preparations for the elections and an election environment will materialise in earnest once the registration of candidate nominations takes place on April 29. Apart from ballot papers, the EC needs to print more than 400,000 nomination forms. The EC, which is working under the immense pressure of arranging for 67 types of election-related materials for May 14, has set itself the target of completing the printing work within 40 days. It has asked the local development officers to deploy officials in all 744 local units by March16 to clear the administrative challenges at the local level. Last week, the government fixed the number of local units at 744 but some of the units are running short of government staffers. In the absence of staff the government has instructed the LDOs to depute the erstwhile VDC secretaries as ward secretaries of the newly created local structures and arrange staff for the vacant positions. Worried that the government may not be able to arrange the required staffing, the EC on Saturday summoned Chief Secretary Somlal Subedi, General Administration Secretary Mohan Krishna Sapkota and Federal Affairs and Local Development Secretary Kedar Bahadur Adhikari to inquire about the state of government staffing at the local level. "They have assured the EC of being able to deploy the required manpower for managing the election," said Commissioner Paudyal. 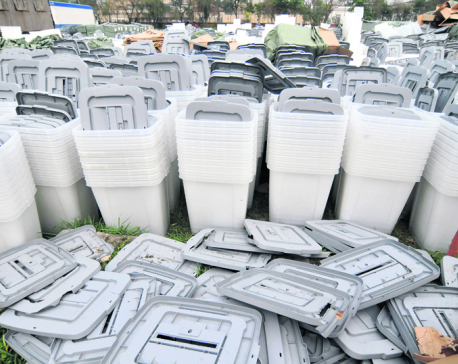 The EC has also awarded the procurement contract for 30,000 ballot boxes. The ballot boxes, according to the EC spokesperson, will be purchased from China as Japan and India have declined to make the procurement within the short span of time. "The local offices have to arrange some of the minor logistics on their own," said spokesperson Sharma.